Smart Fab Sponsored Robert Branford #1, if Only for a Month! 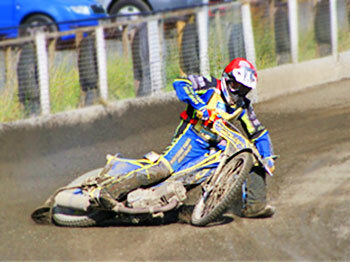 Smart Fabrication sponsored international speedway rider Robert Branford has just completed his second season in the United Kingdom and returns home late October after leaving Australia on March the 1st. Robert competed in the Premier league for Redcar and the National league for Buxton. This was his first season in the Premier league, and it was seen as a chance to learn the tracks and gain experience. Robert was an ever present in all of Redcars 47 official meetings and finished with a 3.5 average. He also doubled up with last seasons title winning team the Buxton Hitmen for a second season, where he missed one meeting while on Premier league duty. He competed in 22 official Buxton fixtures. His official average rose from 6.5 last season to over 8.5 this year which made him one of the top riders in the league. He also finished the year as Buxtons number 1 rider, which completed a rise from number 7 at the start of last season to the current number 1. 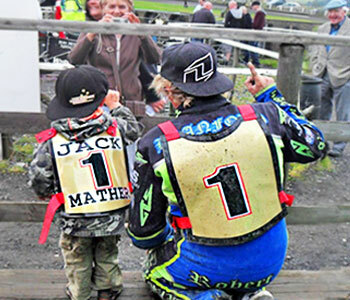 Buxton were not as succesful as a team , although he did help Milldenhall to the play off final and Koc final while guesting as a replacement as there no 1 for a month, including top scoring with 14 points at Rye house and 14 plus 1 at Isle of Wight in late season meetings. Not many riders would take a guest booking at Isle of wight, a five hour drive, followed by a ferry ride from his Matlock base, but to an Aussie distance is no barrier. There were some crashes and bruises along the way and he had the disappointment of missing out on the National League riders championship when he lost a rear chain in his fourth race after he had defeated the top two finishers earlier in the night, and he only needed a second in his easiest ride to win. But rather than put a dampner on his season he finished the year strongly with 10 plus 4 for Redcar his best score and dropped only a cpl of points at Buxton over the closing months and had two maximums. So overall Robert competed in 80 meetings over the 7 month season including a 9 meeting run in 9 days in early September, and raced in over 350 races. Well Done Robert from all the Team @ Smart Fab!